The Association for the Advancement of Sustainability in Higher Education (AASHE) has awarded a STARS Silver rating to Syracuse University in recognition of its sustainability achievements. The Sustainability Tracking, Assessment & Rating System (STARS) measures and encourages sustainability in all aspects of higher education. 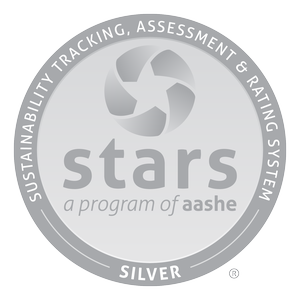 This is the University’s first time rating itself using AASHE STARS, an important benchmarking and analytic tool for the campus as it continues to institute more sustainability programs and infrastructure. Then-Chancellor Nancy Cantor signed the Presidents Climate Commitment, now Second Nature, in 2007, pledging to further increase campus sustainability and carbon neutrally by 2040. In 2005, the University started purchasing 20 percent renewable energy and has since increased the commitment to 35 percent, making Syracuse one of the top 25 schools in the country to purchase renewable energy according to the Environmental Protection Agency. With more than 800 participants in 30 countries, AASHE’s STARS program is the most widely recognized framework in the world for publicly reporting comprehensive information related to a college or university’s sustainability performance. Participants report achievements in five overall areas: academics; engagement; operations; planning and administration; and innovation and leadership. Unlike other rating or ranking systems, the program is open to all institutions of higher education, and the criteria that determine a STARS rating are transparent and accessible to anyone. Because STARS is a program based on credits earned, it allows for both internal comparisons as well as comparisons with similar institutions. Syracuse University is a private, international research university with distinctive academics, diversely unique offerings and an undeniable spirit. Located in the geographic heart of New York state, with a global footprint, and nearly 150 years of history, Syracuse University offers a quintessential college experience. The scope of Syracuse University is a testament to its strengths: a pioneering history dating back to 1870; a choice of more than 200 majors and 100 minors offered through 13 schools and colleges; nearly 15,000 undergraduates and 5,000 graduate students; more than a quarter of a million alumni in 160 countries; and a student population from all 50 U.S. states and 123 countries. For more information, visit syracuse.edu. AASHE is an association of colleges and universities that are working to create a sustainable future. AASHE’s mission is to empower higher education to lead the sustainability transformation. It provides resources, professional development and a network of support to enable institutions of higher education to model and advance sustainability in everything they do, from governance and operations to education and research. For more information about AASHE, visit aashe.org.